This is a digital woodcut made from the photo I posted yesterday. 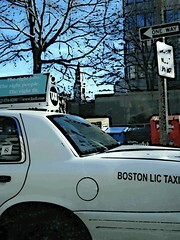 (I took this photo in Boston back in January with my new digital camera.) I am getting a lot more clarity with new camera. I was curious to see how much of the detail would show up in a digital woodcut. I opened the image in Painter IX and fiddled about with the options available. After a lot of trial and error, I arrived at this result. This digital woodcut was created using only colors that were already in the photograph. The effect is subtle; this looks a lot like the original photo but the black lines throughout seem to add a common thread to the disparate elements of the image.